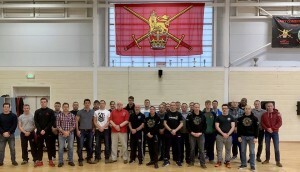 The British Armed Forces Jiu Jitsu Association who have recently joined the BJJAGB National Governing Body attended the National Coaching Course held at Aldershot Combat Centre barracks. 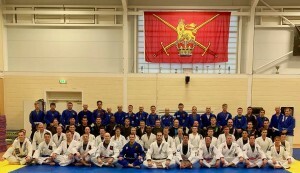 The Armed forces were represented by the Army, Navy and Royal Marines. It was a really brilliant course in which everyone did extremely well over the course of the 2 days. During a break on the 1st Day Roger Gracie delivered a Jiu Jitsu Course on advanced techniques. It was good to meet and talk with Roger and we hope to see him again soon. The BJJAGB would like to thank Lieutenant Colonel Shamus Kelly for his hard work in putting all this together and making it happen and we look forward to a long and fruitful relationship.